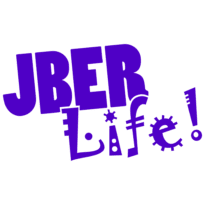 Elmendorf Fitness Center Pool | JBER Life! The Elmendorf Fitness Center pool is closed due to earthquake damages until further notice. The Elmendorf Fitness Center Pool is a 6 Lane, 25-yard indoor swimming pool with a one-meter diving board! Our goal is to make you safer in the aquatics environment. Our certified instructors use the Red Cross Learn-To-Swim Program to provide an outcome based lesson format in a fun environment. 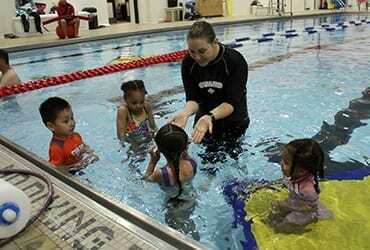 Lessons are available to all ages and swimming abilities. Our lessons are filled on a first come, first serve basis and payment is due at time of registration. 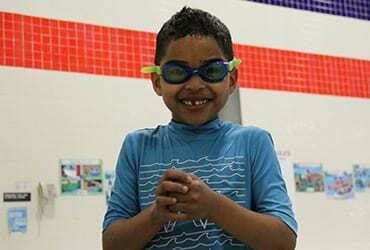 * Swim assessment or swim lesson achievement card is required prior to sign-up. The swim test is for ages 6-15 and will be used during both lap swim and recreational (open) swim times. 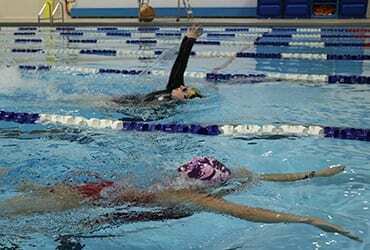 The swim test consists of swimming 25 yards of the pool using either front crawl or breast strokes, treading water in the deep-end for one minute, then exiting the pool without assistance or use of the ladder. Swim tests are by appointment only. All ages must be actively lap swimming when in the pool during lap swim hours. All swimmers must abide by basic lap swim protocols and be considerate of other swimmers. Lifeguards have final decision making authority on swimmers ability to lap swim. The Elmendorf Fitness Pool is primarily a fitness and military training pool only. Open swim is available at Buckner Fitness Pool and the Polar Paradise Pool. 5:30 – 7:30 a.m.; 11 a.m. – 2 p.m.; 4 – 8:30 p.m.